However, Reuters cited Iranian Foreign Minister Mohammad Javad Zarif as saying: "We have made significant progress in the talks, but still we have not agreed on the reviewed solutions." Negotiations on Iran’s nuclear program are now in their eighth day and have entered extended extra time as the sides continue negotiations in Lausanne. "We are working on setting parameters of the issues that will lead to drafting the final deal by end of June," Zarif told reporters. The meeting has been going on through the night between US Secretary of State John Kerry and his Iranian counterpart. The German and French foreign ministers are also present, as well as the UK foreign secretary and European Union negotiator Helga Schmid. The foreign ministers of China, Russia and France left the country on Tuesday after the initial deadline passed, saying they would return when necessary. “We are a few meters from the finishing line, but it’s always the last meters that are the most difficult. We will try and cross them,” French Foreign Minister Laurent Fabius said in Switzerland on Wednesday night when he returned to negotiations. German Foreign Minister Frank-Walter Steinmeier, who has also stayed in Switzerland, said that Iran was expected to bring forth “new recommendations” on the sticking points for a possible deal, after talks stretched on into Thursday. Western diplomats hope for a breakthrough after almost 18 months of negotiations. 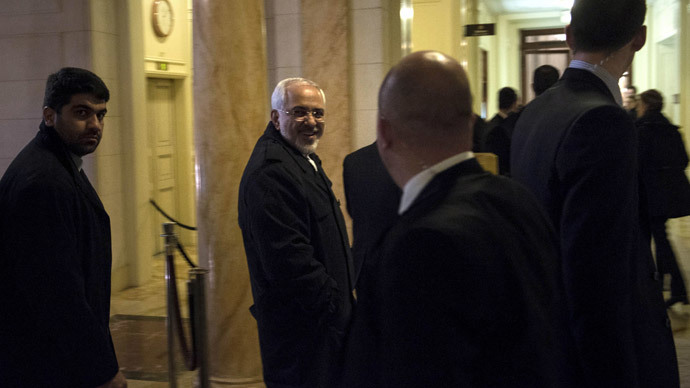 “They require, as I have said, the recognition by all parties that they need to exhibit political will and flexibility in order to move forward,” Zarif said on Wednesday evening. Iran has demonstrated it indeed wants “an entente” with the world, but “will not accept submitting to force and excessive demands,” Zarif said. Iran and six world powers are negotiating a framework deal, which will hopefully lead to a final agreement by the end of June. Tehran insists that it is not pursuing nuclear capability, but some nations have accused it of having a clandestine military nuclear program.